I love the idea of giving homemade gifts but must confess I am usually quite lazy on this front. However, here is one gift idea that I did manage to get around to making (because it’s so quick and easy to make!) A gingerbread body scrub. Not only is it very cheap, quick and easy to put together but it also smells incredible and is super good for your skin! It is thoroughly recommended that you make or purchase a gingerbread man to eat whilst making this scrub. It will make you very happy. Mix all ingredients together in a bowl. If the mixture is too oily, add sugar, if it’s too dry, add more oil. Adjust spice measurements to your liking. Some oils can mask the scent of the ginger and cinnamon, so add more if needed. Pear Upside Down Gingerbread Cake by Use Real Butter – sounds SO delicious! Michelle’s Gingerbread Pancakes from Peachy Palate – These would make the best Christmas breakfast! Gluten-free and vegan too. Sorry about that Lucie. I should have made clear that it should be a mild olive oil - I will add that to the notes and apologise that you had to waste ingredients. Hi this sounds like a lovely idea just wondering how many it make with the measurments. Hi this sounds a lovely idea but how many does it make using the measurments. hi, I was just wondering - how this be made with white sugar instead of brown? Do you think this could work as a salt scrub with either sea salt or Epsom salts? This scrub smells and feels amazing! I have just made it, adding vitamin E oil as well as cinnamon and nutmeg (couldn't help myself!) and have just used it as a hand scrub in order to try it immediately. I was able to make 1.5 containers so one will go in the main bathroom and the other for my girls to use. Thanks so much for sharing!!! I've just made it and it smells like christmas pud because I got dark brown sugar..I just wanted to check does the oil seperate slightly from the mix? I just made some of this to give as gifts at work. It was so easy and it smells fantastic. Thank you for the recipe. How long does it last before it goes off? Hi Ilana, it will last at least 2 months in an air tight container or jar - perhaps even longer (especially if you use the vit E oil) Hope that helps! Hi Aimee, What a cute project! I love it so much that I decided to feature it in our roundup of DIY body scrubs! Check it out here: http://www.favecraftsblog.com/diy-body-scrubs/ Have a great day! Thanks, worked better the second time! Yum- I bet this is awesome. I can't wait to try making it. I would also LOVE to link to your project if you didn't mind. Can I ask you what is in the spice mix? Don't recognize the pumpkin pie mix. Can it be replaced with something else or what would be the purpose of the mix? I want to make this! 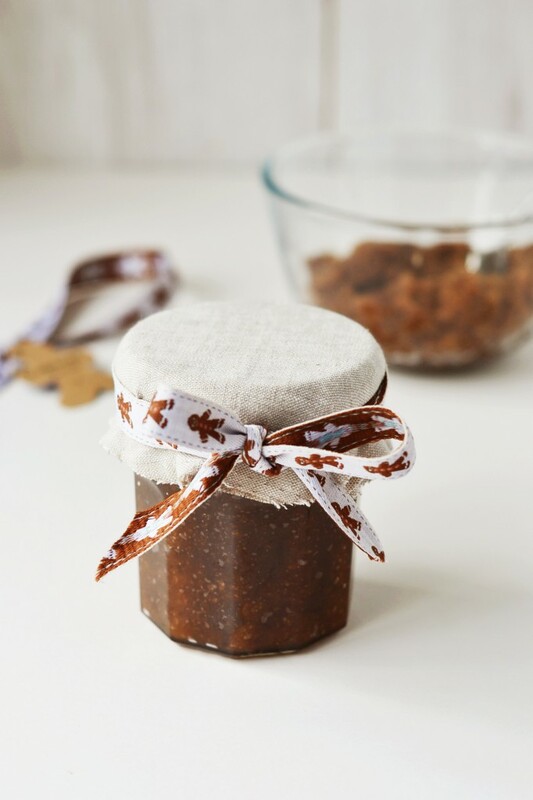 What a cute gingerbread ribbon and adorable DIY jar - homemade & healthy gifts are perfect for the holidays! I’m not too fond of “gingerbread” body products, but I would love to eat them instead - brown sugar, oil, ginger, pumpkin pie mix- sounds like my kinda treat! You know, the olive oil is the only thing that put me off eating the scrub whilst I was making it. But it does smell very tempting! And I'm in love with that gingerbread man ribbon. I've already nearly ran out of it.. I'll have to buy some more! I have pretty sensitive skin so I'm always interested in making my own scrubs instead of store bought. I especially love this gingerbread smell! I LOVE this idea for homemade holiday gifts. I can almost smell that amazing Gingerbread scrub from here in Seattle. Is it normal to want to eat it, too? Hahaha! What a lovely idea and so easy too. There's really no excuse not to try it! Well you'll be glad to know that this batch makes enough for 2 jars so you can keep one to yourself, Holly! Hello Aimee! What a beautiful blog you have! so glad I found it tonight. Like you, I love the idea of homemade christmas gifts, but it often doesn't happen. This looks like the perfect place to start! I love giving homemade gifts, but I especially love receiving them! This scrub must smell so amazing -- gingerbread is a scent that I can't resist! Thank you Monica :-) I think I may have to make another batch of those cookies soon... not only for the taste, but for the sheer joy of using my cookie press again! What a great idea! I bet it smells good too.. Love the pictures as well.. Very creative and chic. Cheers! 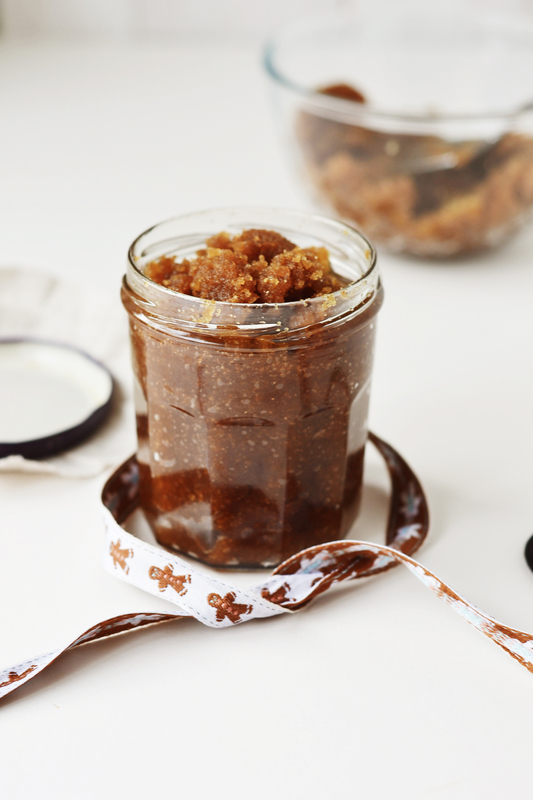 How about gingerbread chia pudding while making this scrub? The only edible ginger thing I have on hand ;) Such a great idea and beautiful pictures! The gingerbread ribbon is so adorable! I have a vast collection of ribbons - do we have that in common, too? I don't have a gingerbread one, though! Homemade gifts are so lovely to receive, and a lot of fun to make as long as it isn't too rushed. This is perfect because I presume it'll keep quite well and can be made a little ahead of time? My Christmas decoration theme is gingerbread man. I have a handwritten recipe from my Gram which I stitched and framed and that was the start of everything gingerbread. I don't want to share this because I think I'll make this for my friends. Love this and so Christmasy, roll on the the month of Christmas joy! This is such a fun idea for the holidays! And I love that this can be done quickly if I need a last minute gift. I'm definitely pinning this to try -- thanks for the inspiration! Oh wow! I bet that smells amazing. Homemade gifts are the best. Love the gingerbread ribbon. Too cute!